At the dawn of the 1930s with the reverberations of 'Black Friday' (29/10/1929) being felt worldwide, competition between carmakers grew increasingly desperate. Thus, while WO Bentley sought to refine his 8 litre into the ultimate luxury carriage, Rolls-Royce responded by dabbling with a sports car concept. Their concerns as to the branding of 'Peregrine' (as the project was labelled internally) were alleviated by Bentley's collapse in 1931. Outflanking rivals D. Napier & Son, they acquired Bentley wholesale (including WO's services) for £125,257. With a department brief that "the new car must be as unlike the Rolls-Royce models as possible" Derby engineers set about preparing 'Peregrine' for flight. Built on a 'double-dropped' chassis carrying all round semi-elliptic leaf sprung suspension and assisted drum brakes, the new car used a tuned version of the Rolls-Royce 20/25's 3669cc OHV straight-six. Boasting twin SU carburettors, a wilder camshaft, strengthened con-rods and a higher compression ratio, this revamped unit developed around 120bhp (a fifty percent improvement) without compromising on refinement. Equipped with the 20/25's four-speed manual gearbox, high-geared worm and nut steering and hydraulic dampers, the resultant 'Silent Sportscar' - as the Bentley 3.5 litre soon became known - was unveiled to great acclaim at the August 1933 Ascot Races. According to Bernard L King's book `The Derby Built Bentleys' this particular example - chassis number B117FC - was supplied new to Major General Charles Ernest Edward Curtoys as a Park Ward bodied four-door, four-light Sports Saloon. 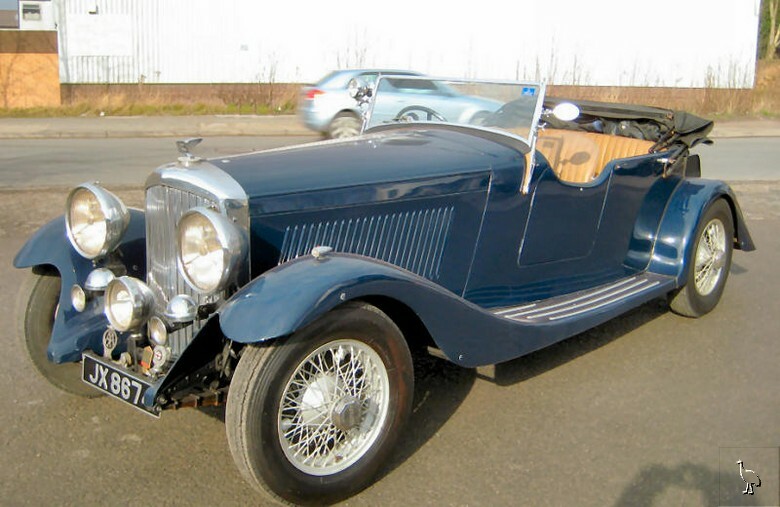 The subject of an older restoration during which it was converted into an Open Tourer, the Bentley pleasingly retains its original engine (number F5BB) and registration mark (`JY 8674'). Finished in dark blue with beige leather upholstery, the rakish four-seater sports a rear-mounted spare wheel, well-stocked aluminium dashboard, cut-away doors and full-flowing wings. Part of a private Lake District collection for many years, the Bentley is understood to have had greater use than some of the other exhibits and to have been in running order until fairly recently. Indeed, it is hoped but not guaranteed that the car will have been resuscitated by the time of sale. Riding on silver painted wire wheels and benefiting from both a full-length hood and tonneau cover, this handsome Derby Bentley is accompanied by a green continuation logbook and V5 / V5C Registration Documents.